Lunch was good. Then again, how could it not be when you’re sitting in the house where General George Patton and his staff lived in the run-up to D-Day? The house is called Peover Hall, and it’s located in the north of England. There’s a pub nearby where Patton and Eisenhower are said to have broken bread during the war. No generals in this lunch, just a group of American and British lawmakers discussing the issues of the day. That may sound a bit stuffy, but remember, the British do things differently. Their districts — or constituencies, as they call them — vary in populations, and they are in a coalition government formed by two parties. It was fascinating to compare notes. After lunch, we went on a tour of Peover Hall, which is in fine shape considering it dates back to the 16th century. 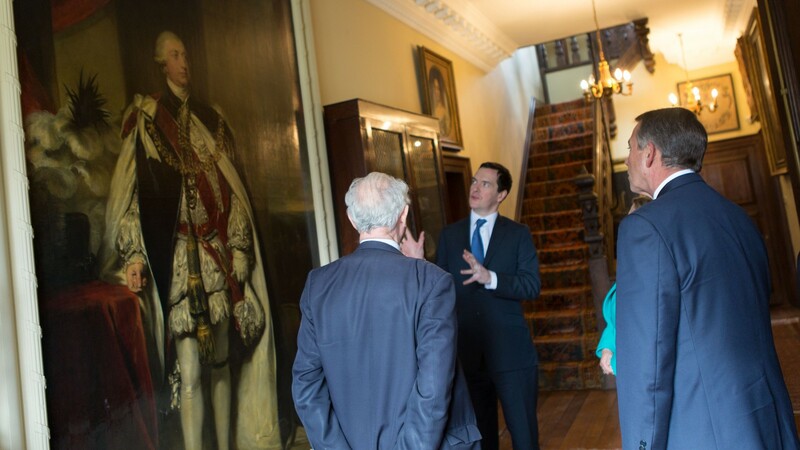 The highlight had to be seeing a big portrait of none other than King George III himself. We spent much of the time talking about the economy, especially given that our host was George Osborne, Britain’s Chancellor of the Exchequer — essentially the Treasury Secretary. George walked us through the turnaround going on in Britain, especially up north, where American-based companies like Waters Corporation and Procter & Gamble — which is based in Cincinnati — are teaming up with British workers every day. It’s part of what makes the special relationship so special, and important: the UK is America’s biggest foreign investor. Of course, we’re all on the same page now, and we’re shoulder-to-shoulder in the same fight to defeat ISIL. Terror is a threat the British people know all too well. Strong Western leadership is something the world needs. To talk about all this in the house where Patton planned thanks to Churchill’s hospitality — at times like this, we need that sense of history. This is the first entry in a series of posts from Speaker Boehner as he travels with a Congressional Delegation in an effort to strength America’s relationships abroad. Read more about his trip to England here.